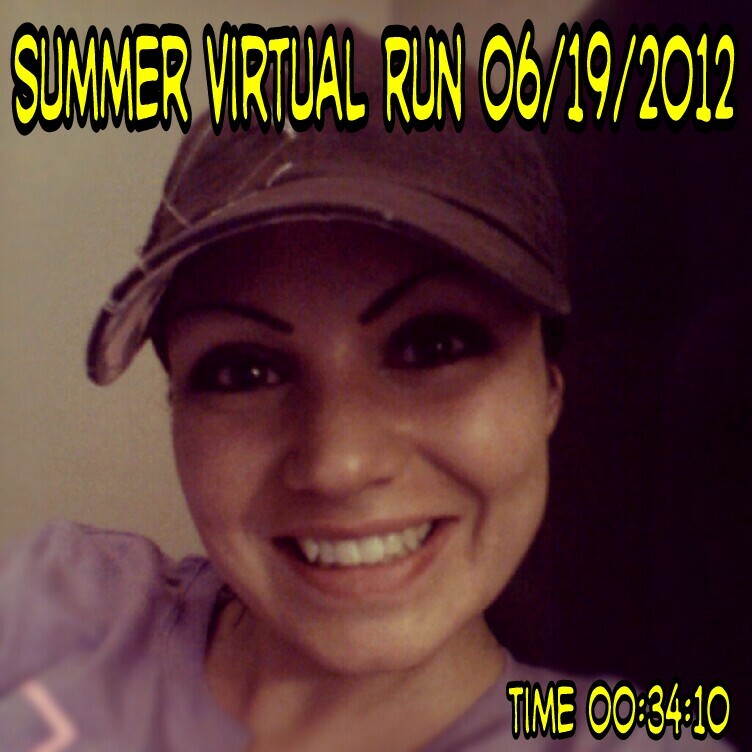 The Restless Runner: Mission Summer Virtual Run: Complete! 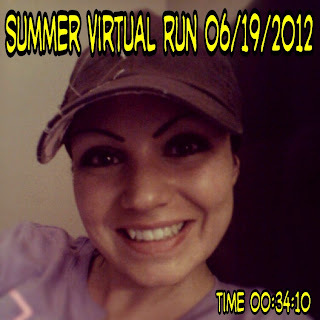 Mission Summer Virtual Run: Complete! After this happened, I had abdominal surgery for my endometriosis ( it was approx. my 11th abdominal surgery over the years), and I also moved from a large house to a small apartment, jobless in Canada. Waiting to heal from both my running injury, and surgery was AGONY! Patience is key. But, I made it. My hip still bothers me from time to time, and I am due for another surgery, shortly. But, I am running better than I ever have! I can feel my muscles gaining some strength back, and I am beginning to love my body, again for the first time. 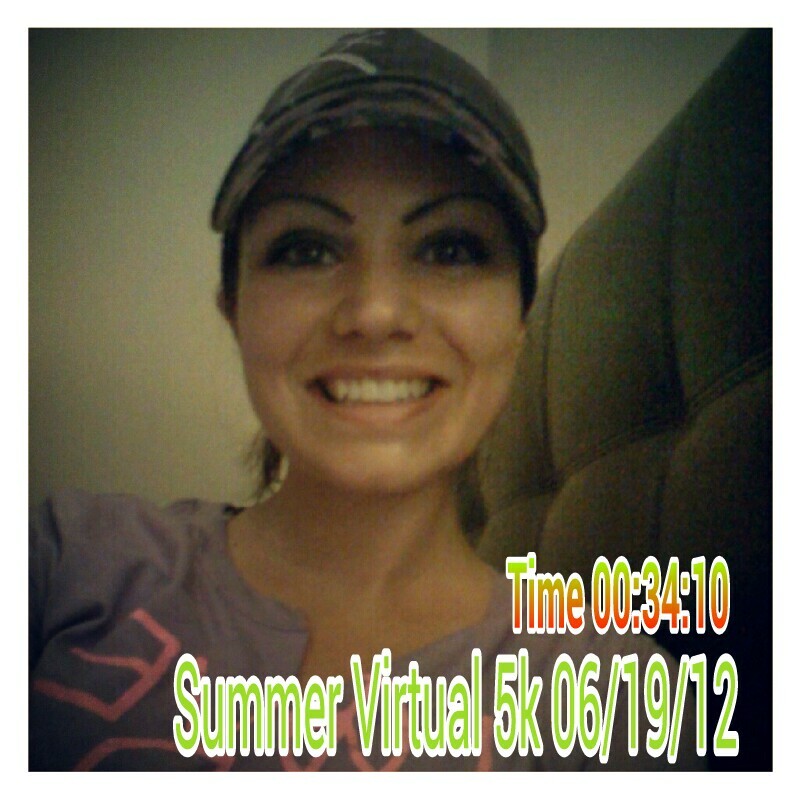 Last night, I ran the Summer Virtual Run 5K/10K. (There is still time to enter! Click on the link to do so, and join a really awesome running community!). My first attempt at the Summer Virtual 5K was Monday night. FYI: Environment Canada has issued a Humidity warning. (REALLY motivating, right? lol) This week will be the hottest week, so far with temperatures hitting as high as 41 degrees Celsius!!! Ontario literally feels like a scorching, wet oven! Le yuck! So out I went, feeling tough and motivated with a "Can-Do" attitude lol. The night was cloudless. The stars were amazing. Ya... I made it one mile. I just could not regulate my breathing, the air was so incredibly thick! So, taking care and caution, I headed home feeling a little defeated by mother nature. Tomorrow is another day, I thought to myself. Come Tuesday, I drank water ALL DAY, as if it was the last day on Earth to ever enjoy water lol. I thought positive thoughts as much as I possibly could, in between cursing the heat..
(I try to remember that our troops are fighting in far worse heat, than we are. So, I really should not be complaining, it could be far worse). 10 pm hit. The sun was down, the street lights were shining bright. Another cloudless sky. Amazing stars. My Mp3 player was sitting on the coffee table, tempting me. And then the craving to run became me. I laced up, stretched, and began to pound the pavement. My shadow ran beside me, keeping me in good form. My calf muscles felt relaxed and loose. My breathing was steady. I made sure to breath deeply from my belly and up into my chest. Slowly. There was a perfect cool, summer breeze. It wasn't pushing against me, but gently urged me on, don't give up ! I made it! And although I am not the fastest runner out there, it felt good. I felt great! I feel very dorky Ha Ha! Great job!!! I love your perservence!!! I have had stress fractures in both my legs, never my hips so I do kind of understand how you feel. Thanks for participating in my virtual run, not sure if I said that in the last comment! Awe, thanks so much for your comments! They made my day and I am really happy you enjoyed my post :) I am about to make a doc's appoint to get my shin splints assessed, actually. They have become quite painful when touched. I hope it's nothing too serious.